Final Cut Pro kicked off a storm in the video-editing field when Apple first released it. Touting non-linear advanced and powerful editing features, it is definitely the best tool to edit and make your personalized videos or movies on Mac. For those who want to add DVD to Final Cut Pro for editing, it isn't without hiccups because Final Cut Pro does not support DVD disc. Fortunately, there is an easy way to fix this problem. To put DVD movies into Final Cut Pro, you need a professional DVD converter. The newly upgraded MacX DVD Ripper Pro will be a great helper, which enables you to easily rip DVD to MP4 or MOV format in H264 codec that Final Cut Pro/Express recognizes, all in one fell swoop. As the best all-in-one DVD ripper for Mac, it also lets you make 1:1 clone of DVD to ISO image, backup your movie content in MPEG2 and copy DVD to MKV with no qualtiy loss, yet all your video tracks, audio tracks, subtitles are kept maximally. 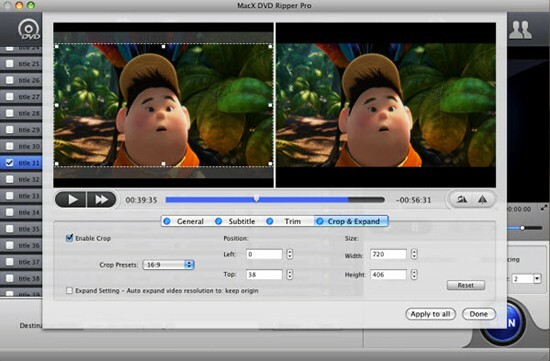 The following steps will show you how to import and rip DVD movie to Final Cut Pro on Mac. MacX DVD Ripper Pro is engineered with a sleek interface, with which you will make a hassle-free DVD ripping. free download this DVD to FCP ripper on Mac OS X, import DVD you want to edit by means of clicking "DVD Disc" button. Alternatively, you can import this disc by hitting "DVD Folder". It is compatibile with the latest MacBook, iMac 4K/5K Retina. Once finish importing disc, this software pops up a profile window where you can choose the output format directly, such as Final Cut Pro, iPhone, iPad, iPod, Samsung, etc. That means you can easily rip and transfer DVD to iPhone (iPhone 7/Plus included), DVD to iPad, DVD to Samsung, etc. After finish the above steps, you can fire off the process by clicking "RUN" button. Plus, this DVD ripper for Mac offers optimized DVD video editing functions, empowering user to crop video file size, trim video segment, merge video files, import external subtitle file (*.srt), and so on to realize different needs. It delivers significantly improved performance on the accessibility to the latest copy protected DVD movies, attributing to the new DVD Navigator Analysis technology that enables you to rip Disney new copy protected DVD on Mac all of a sudden. If you are not familiar with how to use Final Cut Pro to edit DVD movies or videos, here is the Final Cut Pro tutorial for your reference. Notice: The software developer only encourages you to rip DVD for legal personal use, instead of illegal reproduction or distribution of copyrighted content. Please obey your local DVD copyright law before doing it. DO NOT do harm to others' lawful rights and interests. This is a tutorial on how to import DVD to iMovie, or edit DVD in iMovie, with this free DVD to iMovie converter for Mac (macOS Sierra included) you can easily import DVD to iMovie free to create your own videos. 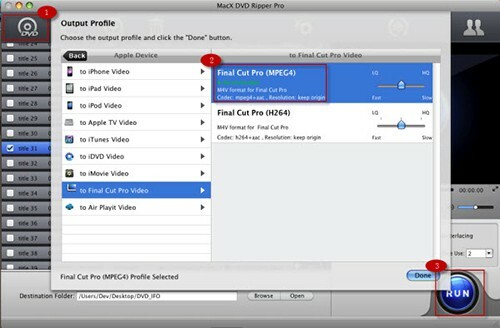 MacX DVD Ripper Pro is ideal tool to rip and import DVD to Final Cut Pro, no matter homemade DVD or commercial DVDs. With High Quality Engine, it rips DVD to any format with 98% quality kept.